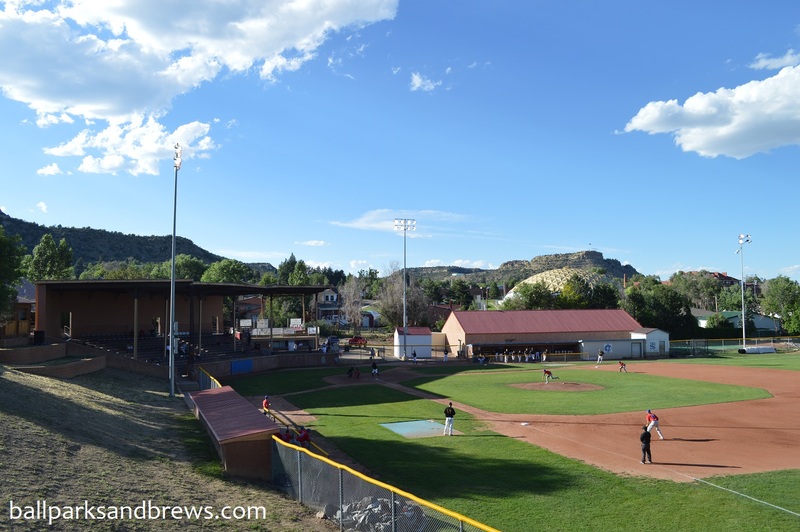 Ballpark Basics: A tiny town, an independent league team and a tv show. 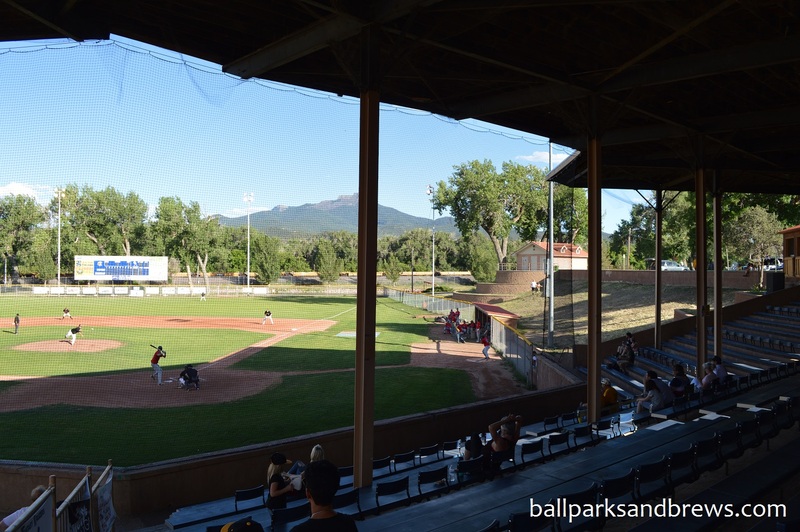 Ballpark Breakdown: The Trinidad Triggers play in the Pecos League, an independent league that has teams spread across Colorado, New Mexico, Arizona, Texas, California and even Kansas. The team (and the league) was highlighted in a short-lived tv show that ran on Fox Sports 1 back in 2014. The ballpark is a bare-bones facility that is situated about a mile from downtown Trinidad. However, we don’t mean that as an insult as we truly enjoyed our time in Trinidad. 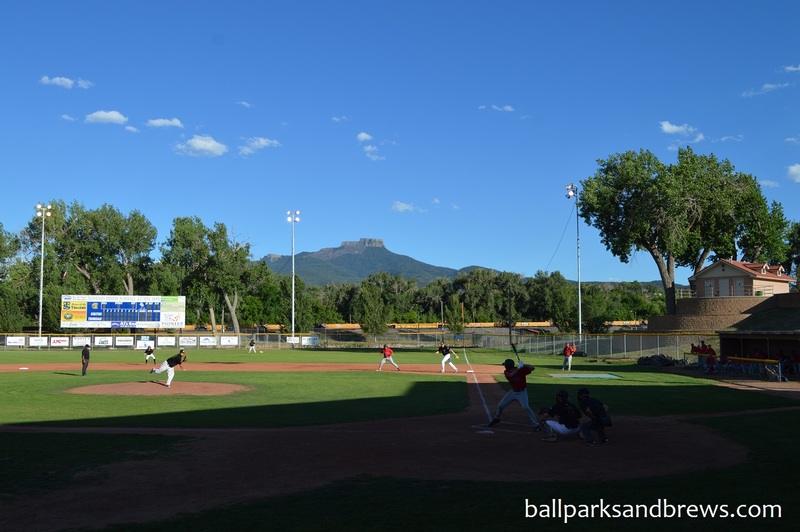 A large concrete grandstand towers behind home plate and gives some much-needed shade from the blazing southwestern sun. There are rows of bleacher seating, some with seat backs, some without. 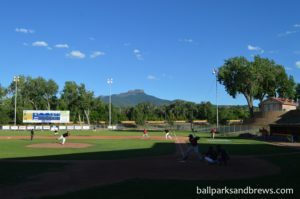 Fisher’s Peak is visible prominently behind the right field wall and gives one of the most unique backdrops to a ballpark that we’ve ever seen. The fan-base is small but enthusiastic. Fans were spread out in the grandstand, some set up chairs in the parking lot overlooking right field, while others hung out along the baselines. The two most ardent fans were a senior married couple that occupied two seats directly behind home plate. Decked out in Triggers gear they followed each pitch as if it were the bottom of the 9th in the World Series. History Nerd Fact: Baseball has a long history in Trinidad. In the early 1900s, Trinidad became nationally known for having the first woman sports editor of a newspaper, Ina Eloise Young. In 1908, she was the only woman sportswriter to cover the World Series. 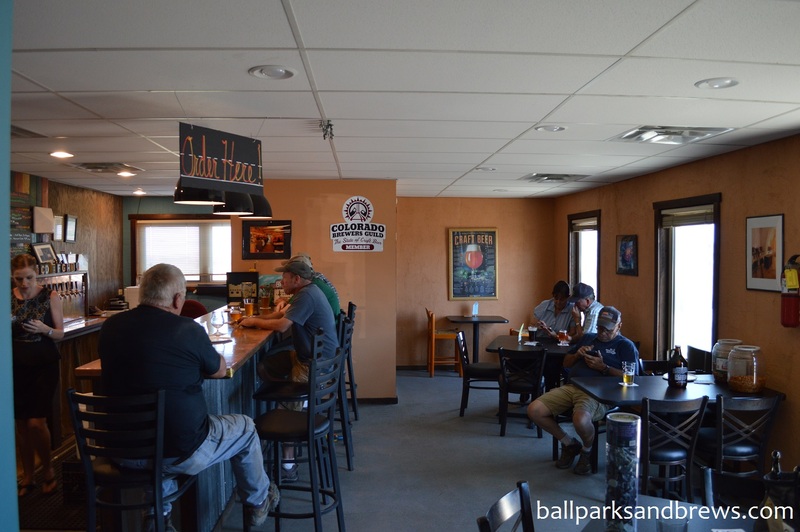 Best Spot for Beer: There is a small snack bar on the third base side of the ballpark. They offered every type of Budweiser product under the sun (including two versions of the Bud Light Lime-A-Ritas) but, unfortunately, nothing local. Apparently Central Park has a 3.2 ABV limit on alcohol served which limits what they can offer from the hometown brewery, Dodgeton Creek. While Central Park might not have all of the added features of your typical ballpark it makes up for it in charm. From the fervent fanbase to the gorgeous backdrop heading to a game in Trinidad is a memorable experience. Brew Basics: An excellent example of why you shouldn’t judge a book by its cover. Plus they have a dog. To get to Dodgeton Creek we drove on dirt roads, second guessed the path and ended up at an “other-side-of-the-tracks” industrial building. Inside, it’s one big concrete room and a bunch of guys hanging out after their shift. 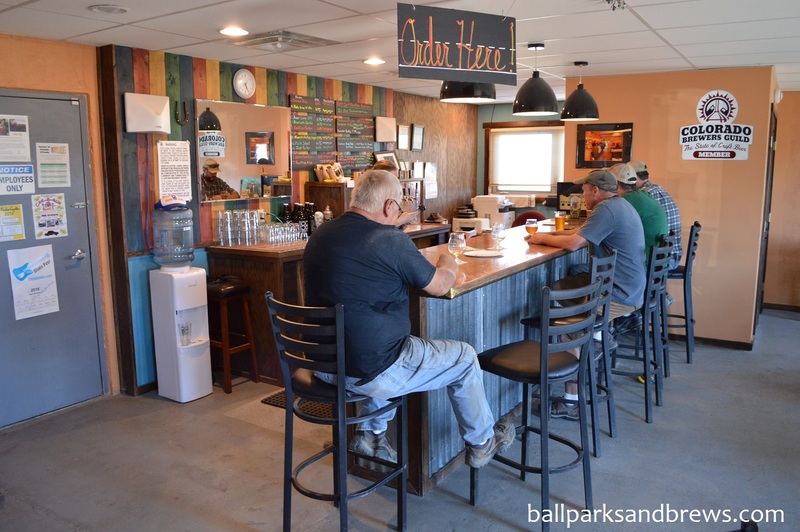 It was quiet, off the beaten path and appeared to be a locals-only type place, instead, we were welcomed in. It’s basically a family operation, and the manager/bartender for the day was a well-dressed redhead who knew her beers, the first name of everyone in the bar, and who willingly answered any question we threw her way. The bar was so full we grabbed a seat at one of the tables, and while we didn’t take advantage of any of these things, pub mix, army guys and other board games and even a microwave were available for patrons. Possibly our favorite part of the whole business was Daisy the dog who kept a close eye on all the goings-on. 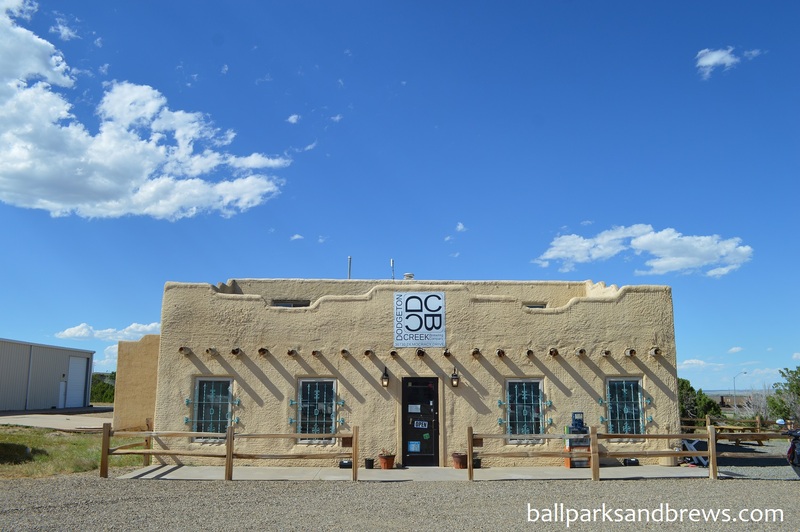 Open just a few years, they really know what they’re doing, so choosing which beers to sample, much less a favorite out of the 10 on tap proved difficult. Red’s Dirty Little Ale (6.9%ABV) – See through red muddy rust color, with a little lacing. Smells like raisin and that flavor and a bit of sarsaparilla come through in a sugared, slightly fruity end. Scottish Ale (7.8% ABV) – Thick, creamy, white head on top of a brown sugar colored beer. Smells of craacker and light spices, tastes dry and first with a syrupy sweet finish. The Scottish Ale mellows as it warms which makes it less sweet, and in our opinion, better. Just Porter (6.3% ABV) – Coffee colored beer with a ring of lacing. Smells of faint, roasting malts. The palate starts light, with hazelnut notes. The middle is malty and the end is thin but there is a decent chocolate taste throughout. Coffee Porter (6.6% ABV) – Another beer that laces the glass, this one ruby brown in color. Similar to the Just Porter, but the infusion of coffee gives this a strong coffee and mocha aroma and a smooth, slightly thin but very flavorful palate to match. Milk Stout (6.1% ABV) – A dark beer with a golden tan head that clings to the sides of the glass. Much creamier than any other Dodgeton beers, you definitely get the effect of the lactose. The smell is heavy cream and palate is malted and bready. Blue Lake Pale Ale (6.65 ABV) – Yellow apricot color, and like all the others at Dodgeton Creek, a ring of white lacing. Light, floral, popcorn smell that is cool and crisp with a big floral, fruity center. Sweetly hop finished, very good and even a little peachy.